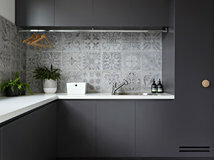 Houzz Contributor with over 15 years as an interiors writer, stylist and content producer for digital and print media. 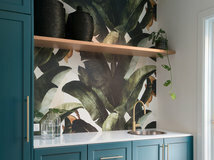 Specialising in house tours, room renovations and decorating solutions, my previous clients include Inside Out (Aus), Ideal Home, The Times weekend supplement and Sainsbury's magazine. 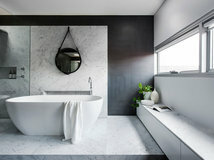 I never tire from the thrill of discovering a jaw-dropping, inspirational home to feature and having an insight into other people's spaces. Call me curious or just nosey! 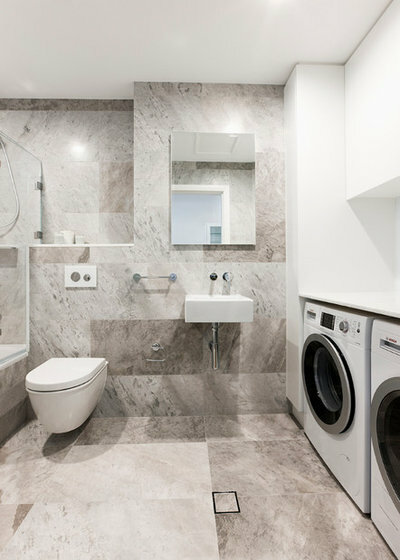 Thanks to modern technology and advancements in appliance designs, your washing machine and dryer can now be squeezed into the tightest of spots, and what better spot than the bathroom? 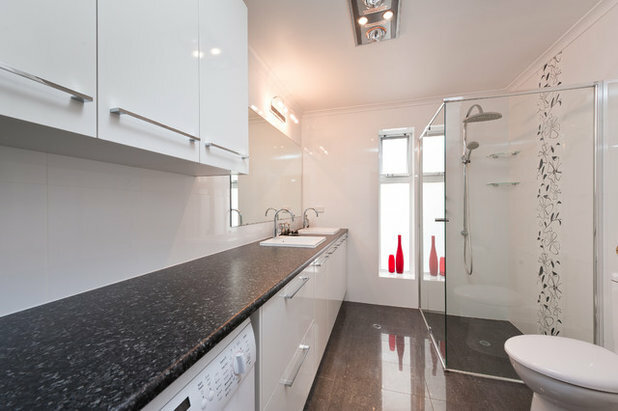 Yes, there may be extra costs of wiring and plumbing to factor in, but it does make sense to have wet washing in your wet room. Not to mention an instant dirty-clothes dumping station. 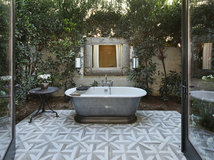 But how do you combine theses two functional spaces and still retain your bathroom’s calm oasis? 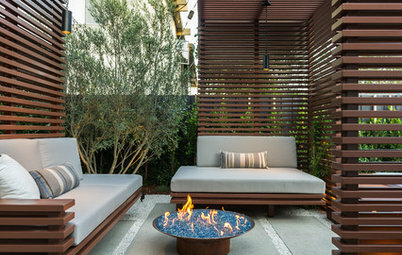 It all comes down to clever positioning and cohesive finishes. 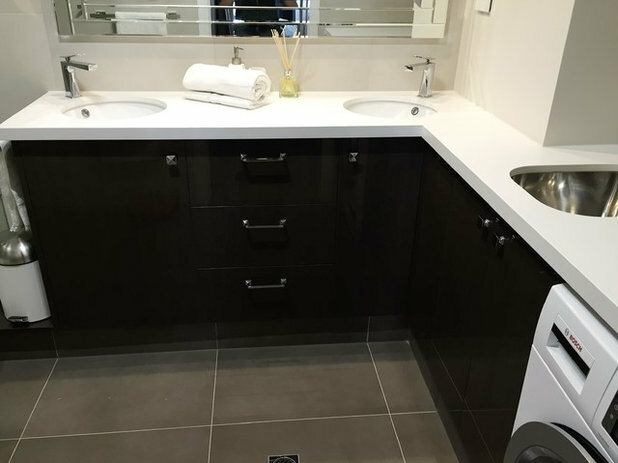 The simplest way of combining the two functions without losing your bathroom’s sense of calm is to conceal the appliances behind doors. 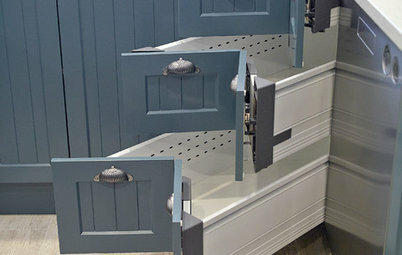 Concertina or bi-fold doors are a great solution for tight spaces as they fold right back without encroaching too much on the room, while an all-in-one washer/dryer will also maximise the space you have to play with. 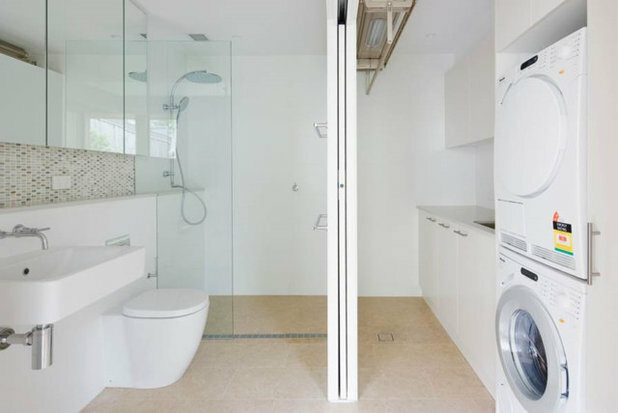 Opt for simple bi-fold doors and they’ll look like a plain, flat wall when fully closed, returning the bathroom to a relaxing sanctuary. 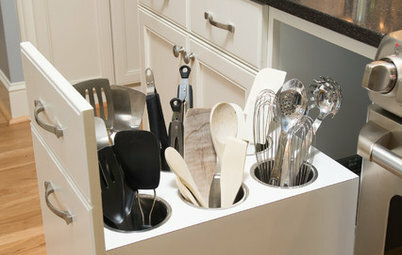 A brilliant way to save space with front loaders is to stack them on top of each other. 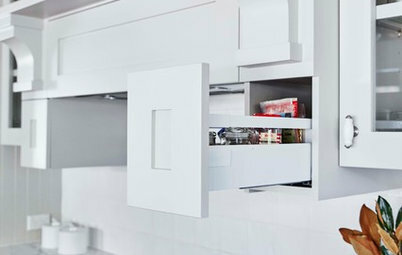 This also means you can pack them away into a built-in cupboard. 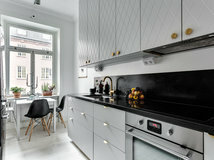 By doing this, the room is separated into two distinct zones, and the noise levels of the appliances are also kept to a minimum behind closed doors. 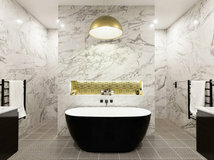 This is ideal if you are planning a soak in the tub at the same time as a wash cycle. 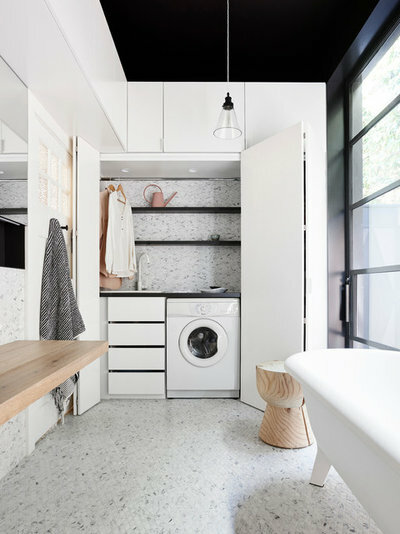 Don’t let your laundry dictate the look of the space; it has to be the other way round so that the appliances become inconsequential to the overall room scheme. 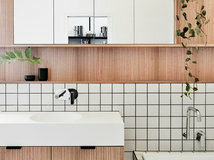 Bold floor and wall tiles are a great way of bringing focus to the soothing bathing zone, and will direct attention away from the working area, particularly if the appliance zone is kept simple with no significant design features. 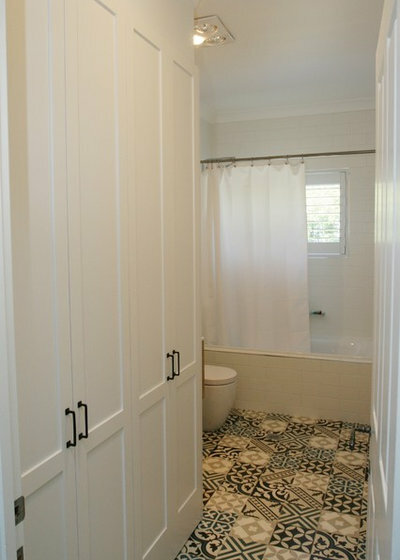 If you have extra space at the entry to your bathroom, this could make the ideal spot for your laundry. 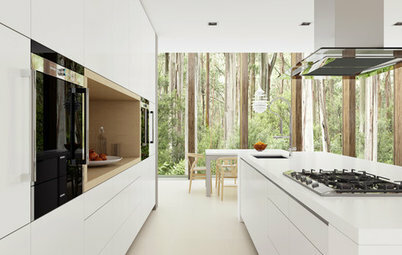 Slim bi-fold doors will combat any narrow openings, while the stackable option will solve the tight squeeze. 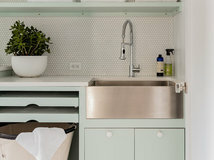 If you have space at the top of the machines, consider adding a couple of shelves for storing your washing powders and baskets. 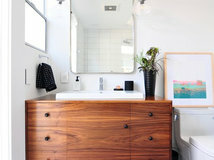 Want a clutter-free bathroom? 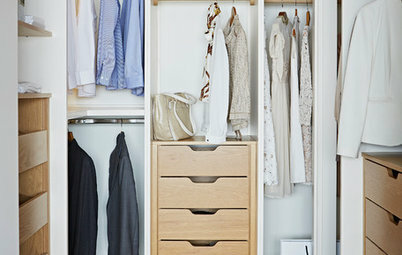 Then a built-in washing basket is a must-have. 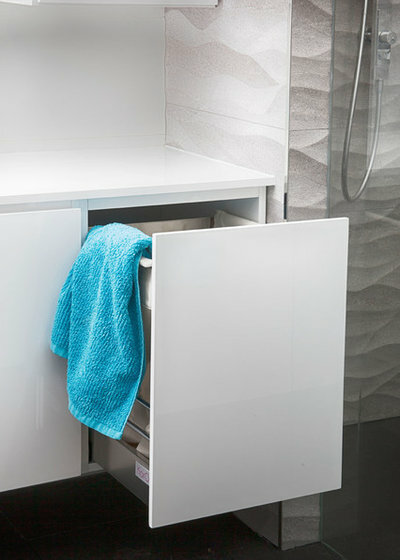 Wet towels or dirty clothes are hidden away, eliminating any chance of unsightly washing piles disrupting your Zen while you take your morning drench. 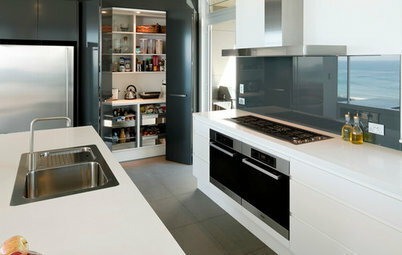 If you have the space for a long run of units and benchtop down one wall, the appliances will tuck in neatly below for a smart, considered look. 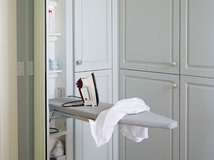 To visually zone the room, add wall-hung cupboards above the laundry spot to define the clothes cleaning area, while a mirror above the basin will mark the pamper-and-preen position. 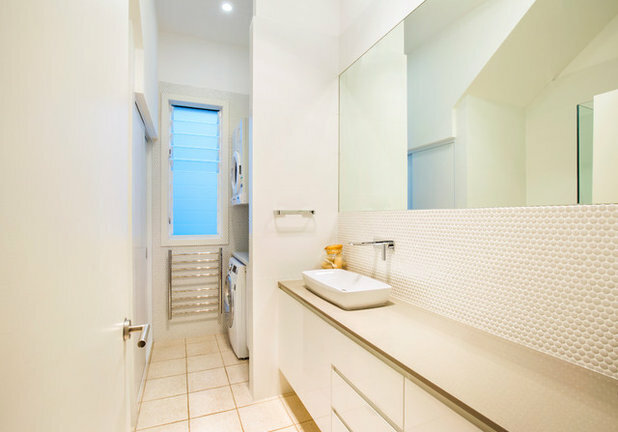 A partition wall is another way to conceal the appliances from the rest of the bathroom space so they don’t disturb the serenity. 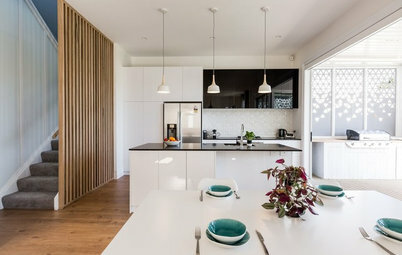 This wall only needs to be the width of the machines, ensuring there is plenty of space for access, and you can disguise the laundry area even more by adding towel rails or shelving to distract attention away from the work zone. 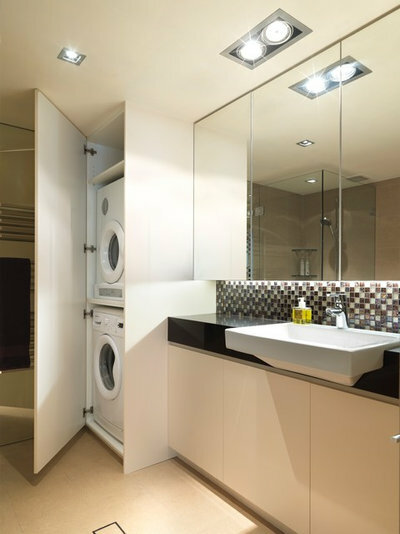 In this bathroom, a bespoke vanity wraps around the wall and into the alcove to incorporate the washing machine, for a streamlined and cohesive flow between the two areas. 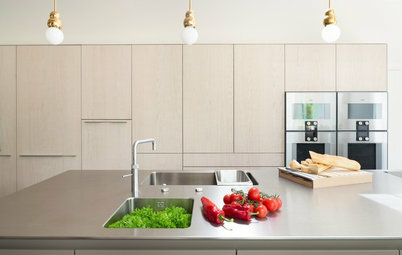 A stainless-steel undermounted sink contrasts with the white wash basins to clearly mark the separate zones. 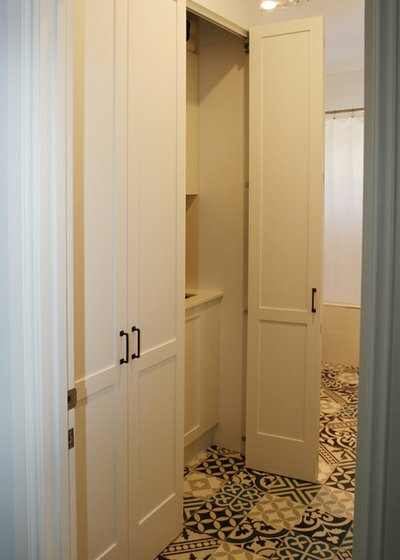 In this reno, beautiful carpentry makes a feature of the concealed laundry, while enhancing the bathroom’s classic palette. 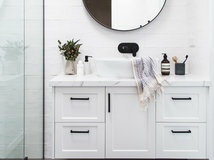 This treatment is reminiscent of a hotel suite that features a walk-though-robe at the entry, giving this laundry-bathroom combo plenty of style points. 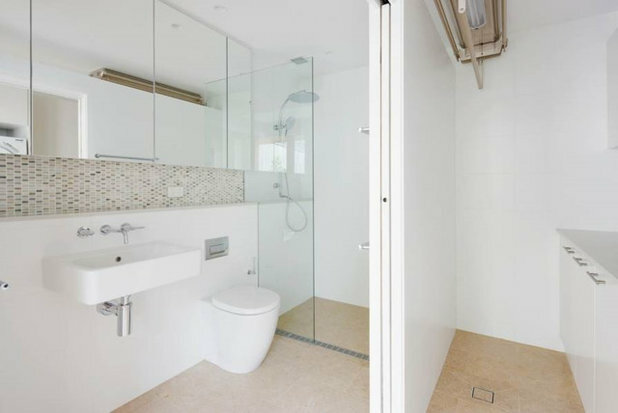 Here you can see how the slim doors fold open to each side, revealing the appliances within but still leaving plenty of room for access to the bathroom beyond. Five gold stars for design. 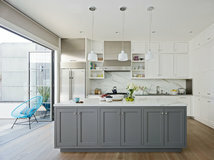 A pocket or cavity sliding door is a clever solution for separating the two zones in one room without forfeiting space that would normally be lost by the door’s swing. 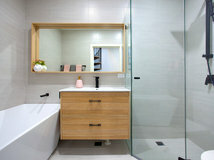 Dedicate a larger percentage of the room to the bathing area by positioning the pocket door off-centre. 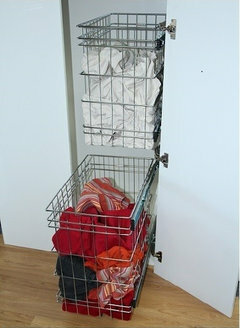 A laundry doesn’t need as much floor area and you can maximise the use of space by adding a drying rack on the ceiling. 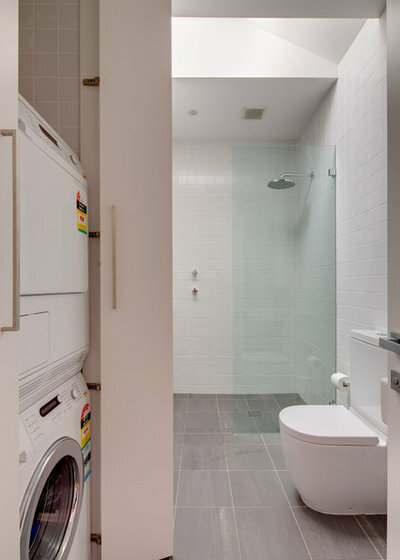 How have you incorporated a laundry into your bathroom? Share your solutions in the Comments below.